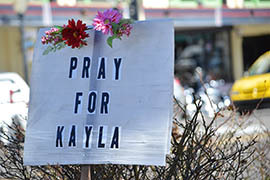 PRESCOTT – As her hometown mourned, family members remembered Kayla Mueller on Tuesday as a free spirit who wanted to be the voice of those who were suffering. Mueller’s parents, Carl and Marsha, and the White House confirmed Tuesday that the 26-year-old aid worker had died while being held captive by the Islamic State group. She was captured in 2013 in the city of Aleppo, Syria, while helping provide medical care to refugees. Her captors claim that Mueller was killed in an airstrike by Jordan. Lyon, joined by Terri Crippes, another of Mueller’s aunts, said the Northern Arizona University graduate found her passion as a humanitarian at a young age. The Rev. Kathleen Day, who heads the United Christian Ministry at NAU, recalled Mueller being part of a campus group that promoted world peace and made a trip to Guatemala. That passion continued as Mueller shared gripping accounts about the suffering in Syria and urged the world to help, Day said. After graduating from NAU in 2009, Mueller worked with a variety of humanitarian organizations in countries such as northern India, Israel, Palestine and France, her family said. Mueller’s parents kept her captivity a secret as they worked with U.S. officials to try to win her release, but they confirmed it after her captors claimed last week that she was dead. The family released a letter Tuesday that Mueller wrote in 2014 and that her captors shared. “None of us could have known it would be this long but know I am also fighting from my side in the ways I am able + I have a lot of fight left inside of me,” she wrote in the letter. “I am not breaking down + I will not give in no matter how long it takes,” the letter said. Prescott residents Ross and Pamela Zappia attended the news conference and said they were shocked at the news. The couple said they occasionally saw her working at a store before she went abroad. Carol Thompson, who teaches political economy, international trade and finance NAU, said in a telephone interview from Zimbabwe that she had Mueller as a student and worked with her at the Flagstaff Peace Center, opposing war but welcoming student veterans. “Kayla was very intellectual, very smart, and engaged herself in analyzing complexity even contradictions. She very much enjoyed discussing problems in that way,” said Thompson, who is on sabbatical. 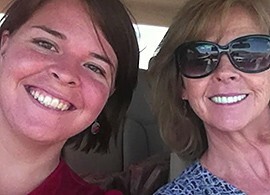 “At the same time she was highly compassionate, and that combination was beautiful,” she added. Thompson said Mueller died doing the work and engaging in the kid of relationships she wanted. Cronkite News reporter Kristen Hwang contributed to this report from Washington. Friends and family of Kayla Mueller give their reactions to the news that Mueller has died while imprisoned by ISIS militants. Full coverage of the death of Kayla Mueller at the hands of ISIS. A sign in Prescott urges support for Kayla Mueller, whose family said Tuesday it had received confirmation that she had died as a captive of the Islamic State group. 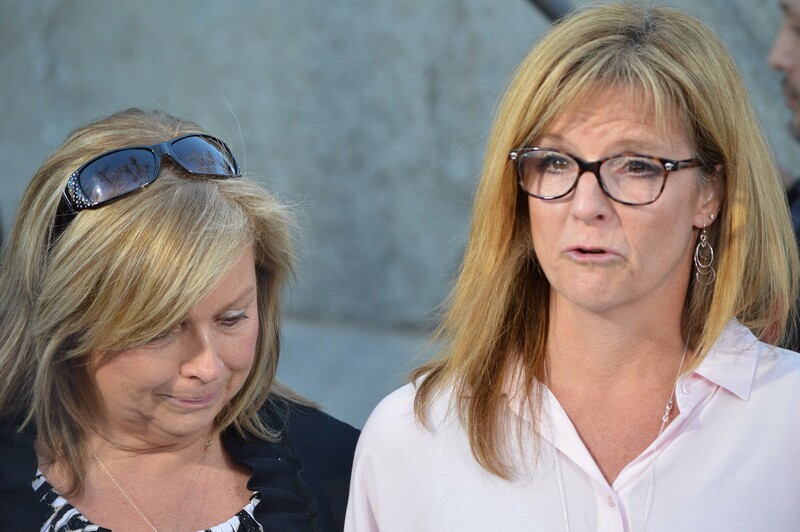 Lori Lyon, right, and Terri Crippes, aunts of Kayla Mueller, share a statement on behalf of the famiy at a news conference Tuesday in Prescott.